Military reports warn that impending energy problems will endanger Western society and threaten to weaken ties between states and their citizens, undermining the very foundations of democracy and the rule of law. Energy issues will also set the stage for more aggressive geopolitics and will substantially destroy the ecosystem services on which society is wholly dependent. These are but a few of the impacts that the double energy problem of climate change and oil decline have in store for us. In this illuminating book, attorney and pragmatic visionary Roger Cox sets out and analyses these energy stress tests, going on to explain why neither the market mechanism nor today’s political model are capable of initiating an energy revolution to solve these issues. This deadlock situation has the potential to bring about the very downfall of Western society, as this book explains, and will at the very least put Western countries at risk of committing domestic human rights violations on a scale nobody had thought to ever see again after World War II. Precisely this threat of human rights violations puts the judiciary in a position to step in and lead Western governments out of the dangerous deadlock. 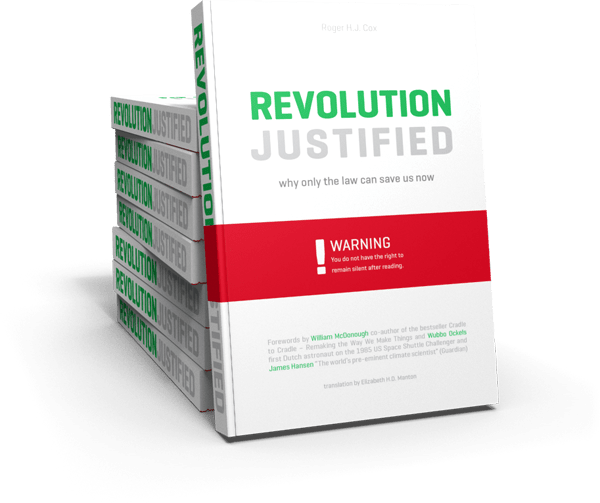 Drawing and expanding on examples and cases from the US, the UK, the Netherlands, Europe and the European Union, this book demonstrates that the West’s legal systems already contain all the elements needed to achieve an energy revolution faster and more effectively then any other alternative. Source: Roger Cox, Revolution Justified! ← Previous Post VN-klimaatrapport: België krijgt zware klappen! Next Post → Smappee.. a good investment!